Now it’s Rifkind and Straw: How many of our “cash for access” legislators are selling out the national interest? 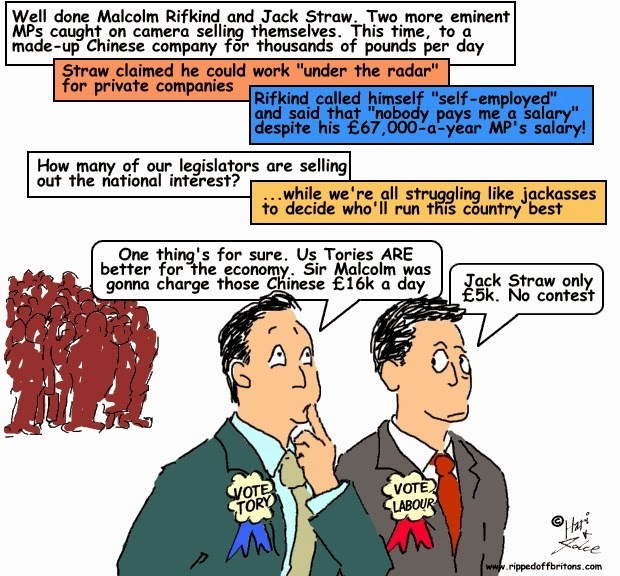 Labour’s Jack Straw and the Tories’ Sir Malcolm Rifkind were secretly filmed discussing how they could use their contacts to benefit a private Chinese company and both boasted about charging at least £5,000-a-day. In the conversation with the undercover reporters Sir Malcolm was filmed discussing that his usual fee was 'somewhere in the region of £5,000 to £8,000' for half a day's work. Straw told undercover reporters he would expect £5,000 per day. MPs earn £67,060-a-year, but Sir Malcolm claimed this was not enough for someone of his professional background. Challenged about why he does not do voluntary work to provide experience of the world outside politics, Sir Malcolm told BBC Two's Daily Politics: 'I have two objectives, I have to have that broader hinterland as you so nicely describe it, but I do also want to have the standard of living that my professional background would normally entitle me to have.' Defending his position, Sir Malcolm said there were 'about 200' MPs who had business interests and insisted many members of the public did not want 'full-time politicians'. He said that 'many ex-ministers, former chancellors, home secretaries, prime ministers, as well as other people, have served on advisory boards' and insisted it was 'entirely proper'. Jack Straw, the Blackburn MP, told how he had used his influence to change EU rules on behalf of a private company he already works for and declares an interest in. He also claimed to have used 'charm and menace' to persuade the Ukrainian prime minister to change laws on behalf of the commodity firm, which pays him £60,000 a year. Mr Straw, 68, said he would not take on the role while he remained an MP, but could be more helpful if he were to become a peer in the House of Lords after the election. The most fearsome beast in the political jungle is you, the voter. Now is the time to wake up and roar! As top flight 'Westminster Creatures' these two dishonoured 'Honourables' must surely indicate that Westminster attracts the wrong kind of individual or degrades its intake regardless of initial state. Either way WESTMINSTER THE ENEMY. But Westminster is a citadel with layered ramparts of devious 'regulation'. To try to penetrate it with 'rule of law' is to be reduced to impotent despair.